3 roses mean I love you, give 3 roses on the 1st anniversary month of love. 3 roses signify the three words "I love you". It is customary to give 3 roses on the 1st anniversary month of love - No. 3 is an odd numbers are considered lucky in China because its pronunciation is similar to the word "born" in Chinese. 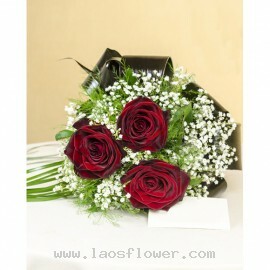 A bouquet of 3 red roses accent with white gypsophila flowers fluff and pretty foliage. * Roses can choose from several colors such as red, white, pink, yellow, orange, purple, etc. Please let us know when ordering or email us. Occasionally, substitutions may be necessary to create your bouquet d.. 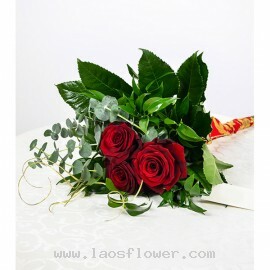 Bouquet of 3 red roses, we use long stemmed roses to arrange a long bouquet and wrapped with bright color bows. * You can change the color of the flowers by request when placing an order. Occasionally, substitutions may be necessary to create your bouquet due to the availability of certain flower..
A vase of 3 red roses accent with white daisy and eucalyptus leaves and tied with white ribbon. 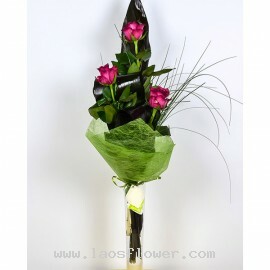 The color of roses and materials can be changed by informing our staffs when ordering or by e-mail. Occasionally, substitutions may be necessary to create your bouquet due to the availability of certai..
A bouquet of 3 white roses - we only use long-stemmed roses wrapped in brown paper and white paper and tied with a small white bow. * Customers can choose to change the color of the roses as you like. Occasionally, substitutions may be necessary to create your bouquet due to the availability of c.. Bouquet of 3 red roses wrapped in green paper and green ribbon. You can choose the color of the roses, paper, and ribbon. Occasionally, substitutions may be necessary to create your bouquet due to the availability of certain flowers in various parts of the country. Substitutions may be necessary ..